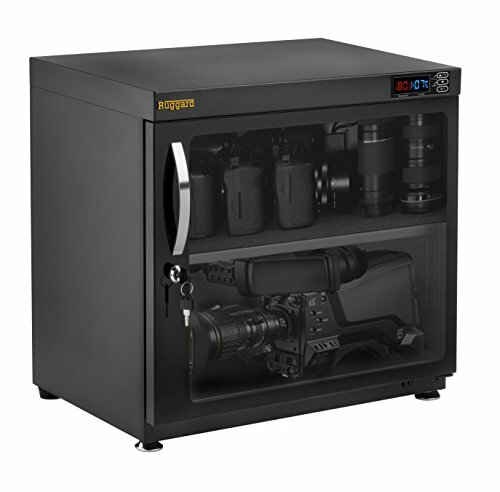 Protect your lenses, photographic and optical equipment, mobile electronics, and other valuable accessories from excessive moisture, dirt, and dust with the Ruggard 80L Electronic Dry Cabinet. The cabinet's fast-acting TE Cooling Wafer regulates the interior's relative humidity from 35-60% to help prevent fungus and corrosion that can damage your gear. Humidity adjustments take place over a 1 to 3-hour period. Fully-featured, the cabinet has a lockable, rubber-sealed glass door, with two keys, and a front metal handle. A large, dimmable LCD displays ambient temperature (in Fahrenheit or Celsius), relative humidity, and other settings. Interior LED lights make viewing and finding gear easier, and both the base and the adjustable steel shelf is padded to help guard against scratches. The Electronic Dry Cabinet is powered by an included multi-voltage power supply. In addition to being near-silent, without a fan or compressor to make noise, the unit is also dripless, eliminating the need for a water tray. To prevent unwanted movement, the bottom of the cabinet has four rubber feet and two are leveling feet for installing on uneven surfaces. Box Dimensions (LxWxH) : 23.8 x 22.9 x 17.2"
If you have any questions about this product by Ruggard, contact us by completing and submitting the form below. If you are looking for a specif part number, please include it with your message.